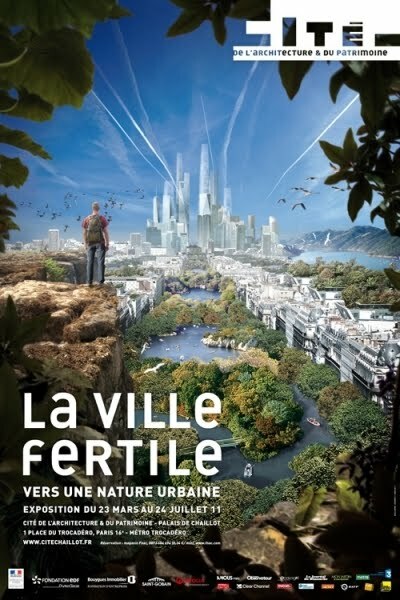 If you're in Paris before 24 July a spectacular exhibition called The Fertile City: Towards An Urban Nature is well worth a visit. A nature-artifice riff greets you at the door. In the opening room of a vast subterranean gallery, 2,000 real plants, including palm trees and giant ferns, are kept perky by overhead racks of gro-lights. These are so bright they can blinding to mammals, such as museum visitors, so the plants are only lit up properly at night when the museum is closed. The Fertile City comes two years after proposals to make Paris "the world's most sustainable post-Kyoto metropolis" were made by 12 famous architects in a big competition. My reaction then was although architects are adept when it comes to dreaming about possible futures, their interest tends to wane asked to get their their hands dirty, and feet wet, in the context where their dreams would be built. The same caveat applies to The Fertile City. It's a brilliant and coherent spectacle - but the poster says it all: "Look At Me!" There is nothing here about the social and economic changes, the mud, the work - and the strife - that will be needed if our cities are to become fertile sponges in real life. Filling up cities decoratively with plants and trees is not bad in itself. As New Scientist reports this week, urban areas might not be so bad for the environment as long as there are plenty of trees around. Cities, and not just rainforests, can provide ecosystem services. But the Fertile City is only plausible as a scenario if one believes that vast sums of money will be available for contractors and landscape designers make it happen on our behalf. Many of the show's luscious images feature rich-looking urbanites lolling around on a variety of green playgrounds. For them, life in the Fertile City is literally a picnic. Hmmm. Could be they'll be disappointed. The Fertile City is like a still-life painting of an overflowing fruit bowl: decorative, but you can't eat it. It made me recall fondly the mess and conviviality of City Eco Lab in 2008. That was a much less polished and elegant affair but you *could* eat it - or at least, in Bernard Thevenon's amazing Cantine 80km.